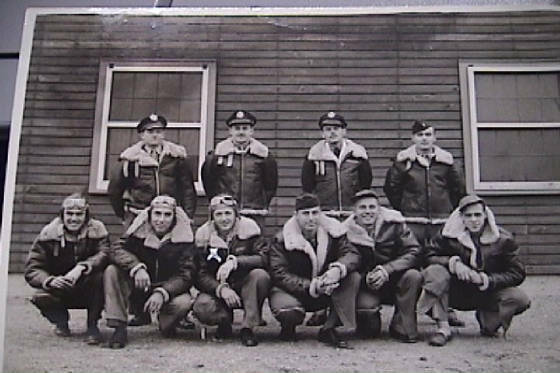 Lt Cyril F. Coverly (N) Capt. 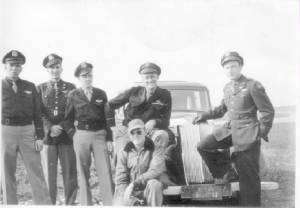 Coverly was OIC MATS C 124 Loadmaster Transitional Training at McCord AFB & PBAFB in early 50's. SSG William A Gauntney -RO; SSG Alberto A Bishop -LW Gunner; SSG Kenneth L Hall -Tail Gunner; *see missions below] SSGT Denzel F Stumbo -Ball Turret: SSG Dwayne H Aurand -Eng. Top Turret: SSG Robert W Funk- RW Gunner. 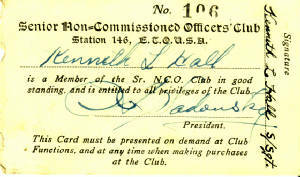 Comment by Webmaster--I recall being in the NCO club on two Occasions One with our crew the other a dance was held for completion of the groups missions at the hundredth mark or two hundredth I have forgotten .Truck loads of girls from a Naval Base at Great Yarmouth were in attendance. I recall promising one little redhead I would come visit her. 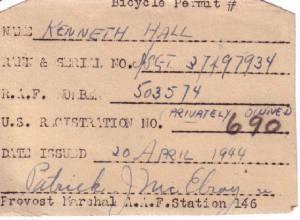 I never did keep that promise.---- The bicycle permit I'm in trouble. I had a bicycle but I do not recall getting a permit. I left it with an English Lass that lived near a PUB I visited often in Norwich.The first time I met her I almost got myself into trouble because I demanded all present shut up and let her sing Bing Crosby's version of "Swinging On A Star". She was good. From that time on patrons requested her to sing when we visited that Pub.